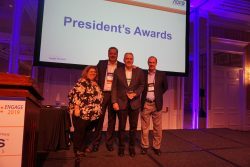 St. Charles, IL (March 25, 2019) — AOPD has just concluded its 2019 Annual Meeting, “Engage 2019,” at The Park Hyatt Aviara in Carlsbad, CA. The AOPD Annual Meeting provides the opportunity for AOPD Business Partners and Dealers to discuss sales and marketing strategies for the upcoming year. In addition, there are education and networking sessions spread throughout the agenda. The event concluded with the Annual Awards Dinner and City of Hope Presentation. Kommah McDowell, a past City of Hope patient, shared her victorious battle over a rare form of breast cancer. AOPD then presented City of Hope with a check as a down payment for their yearly promotion that runs April 1st – July 31st. AOPD presented the President’s Award for Dealers to Wayne Stillwagon, of Miller’s Supplies at Work, and Brent Woods, of BIC Corporation, as the Business Partner recipient. Both awardees are well deserving of this prestigious award and have been long time supporters of AOPD and the IDC. In addition, AOPD presented the M.C. “Bud” Mundt Outstanding Achievement Award to Mr. Champ Davis Jr. Champ was AOPD’s legal counsel, who sadly passed away earlier this year. He had been an integral part of AOPD, dating back to the 80’s. His widow, Jan Davis, accepted the award on his behalf and gave a touching speech on the importance of AOPD to Champ and their family. This award is given to those individuals that exemplify long-term leadership and service within the AOPD organization. © 2019 American Office Products Distributors, Inc. All rights reserved.